This page is about the German twin-engine fighter Me 410 B-6/R3. For other uses, see Me 410 (Family). The Me 410 B-6/R3 is a Rank IV German twin-engine fighter with a battle rating of 5.3 (AB/RB/SB). It was in the game since the start of the Open Beta Test prior to Update 1.27. The Me 410 B-6/R3, unlike its predecessors, has two 30 mm cannons in addition to the regular 20 mm cannons found on any Me 410, however, the 7.92 mm machine guns have been removed). With the HVAP-T upgrades, the 30 mm cannons make short work of light pillboxes, light and medium tanks, and even heavy tanks if hit on the side or back. Your primary goal should be unlocking the (Tier III) 30 mm ammunition belts. 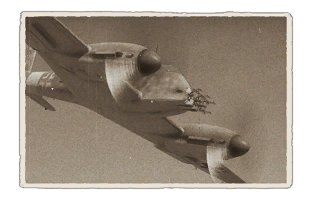 The "Hornisse" is most well suited for bomber hunting, due to its heavy armament. The aircraft can even use BnZ tactics against other aircraft provided if there is enough altitude. If you are planning to do aerial combat, be sure to side climb, as the 410's climb rate is far from superior to the Spitfires and Bearcats you will face. It is also equipped with airbrakes, which is quite unusual for an aircraft of its size and role. As with any plane, it is inadvisable to attack a bomber by sitting on its tail. It is advisable that you key-bind the 20 mm and 30 mm cannons separately if you are going for the CAS role it is well-suited for. Binding different buttons to fire the cannons separately can conserve a lot of ammo, which you can discriminate between which calibre to use when going after heavily-armoured or lightly-armoured targets. When choosing to go for the Intercept role, it is important (though you do not need too) that you cue the 30 mm and 20 mm together, as it will make much more of a difference in the 1-3 seconds worth of a good deflection. The Me 410 B-6/R3 is equipped with a FuG 202 search radar, located in the nose of the aircraft; a control box which is part of the radar damage model is located behind the pilot.